An all inclusive water villa resorts / overwater bungalow resorts is an easy and wonderful way to spend your quality time without worrying about overprice tags at your favourite location. There are about 20 all inclusive water villa resorts out of 80 overwater bungalow resorts (approx.) in the Maldives. It’s an amazing way to plan your holiday without thinking about costly meals, and other activities. Most of these all-inclusive water villa resorts in the Maldives are operating based on at least full-board basis or all-inclusive basis. It is one of the most important things when you book your overwater bungalow / water villas in the Maldives. 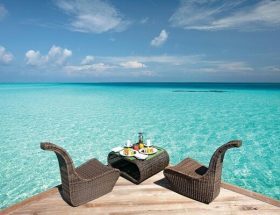 A few visitors are interested in best all-inclusive water villa resorts in the Maldives. On the other hand, some visitors are interested in less expensive overwater bungalow resorts or cheapest among all. 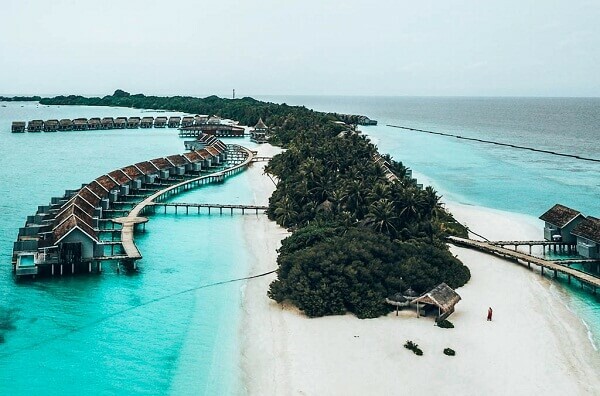 However, our observation says that, all-inclusive Maldives water villa resorts are little bit expensive compared to other normal water villa resorts. But all-inclusive resorts in the Maldives includes many things in your booking. We have compiled a list of best all inclusive Maldives water villa resorts suitable for every occasion i.e. birthday celebration, wedding anniversary, new year party, Christmas holiday, Eid celebrations, Easter, and others. The Maldives is included in our list of the best overwater bungalows destinations around the world. Lily Beach Resort and Spa Maldives is one of the highest rated overwater bungalows resort / water villa resorts in the category of all-inclusive in the Maldives. In 2009, the resort was fully renovated and refurbished to cater the needs of the customers. Right now, there are 3 room categories available in the resort. Platinum plan or you say “all inclusive deal” includes all meals, cigarettes, premium liquor, and other things. During the peak season especially in December and January, the resort gets fully booked and it’s quite difficult to get any water villa over there. This super luxury water villa resorts offers great view, amazing holiday experience, mouth watering meal, and many other things. Veligandu Island Resort is one of the less expensive all-inclusive water villa resorts in the Maldives. 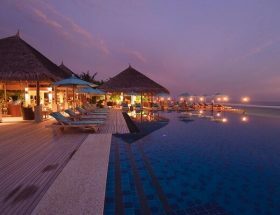 A less price does not mean less quality, the resort is one of the best places to spend your holiday in the Maldives. Due to it’s popularity, a lot of customers spend their holiday again and again here. Veligandu Island Resort offers a lot of water activities, dining options, and best experience in every sense. Veligandu Island Resort offers “full-board” plans which typically includes your 3 meals per day. If you are ready to pay extra money, you can opt for all-inclusive plan of this resort. An all inclusive plan includes snorkelling season, non-alcoholic drinks, alcoholic drinks, meals, sunset cruise, kayaks, fitness centre, and much more. So, it’s a great deal for your holiday! The Constance Moofushi Resort is one of the most beautiful private-island resorts in the Maldives. It’s a five star resort, located on the Moofushi Island, Maldives. The whole island resorts working on a basis of all-inclusive packages, which includes stocked minibar in your room, 3 meals a day, water sports, premium liquor, afternoon tea, cigarettes, and much more. From it’s inception, the resort constantly receives high ratings from customers worldwide. In low season, you would get a very good deal. On the other hand, you have to pay more for high season. Kuramathi Maldives is one of the best all inclusive Maldives water villa resorts. 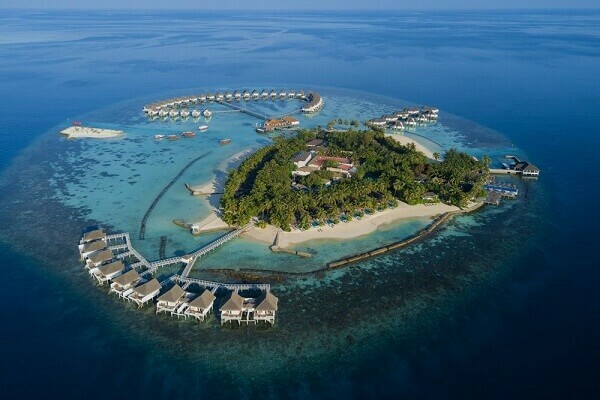 In addition to this, it is one of the largest private islands in the Maldives with 360 rooms, 129 of which are water villas that come in two classes. The resort offers excellent modern amenities, such as Wi-Fi, a semi open bathroom, a rainshower, laundry service, hot tub, and much other things. In all inclusive plan or sometime called “full board” includes all meals, most activities except premium things, and alcohol are charged extra. Kuramathi Maldives has many amenities, which includes 6 bars, 2 pools, a spa and a fitness center. If you loves snorkeling, then the resort offers guided snorkeling tours to the guests. 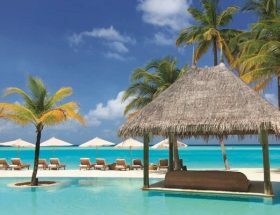 Centara Grand Island Resort & Spa is one of the best all inclusive resorts in the Maldives for many occasions. 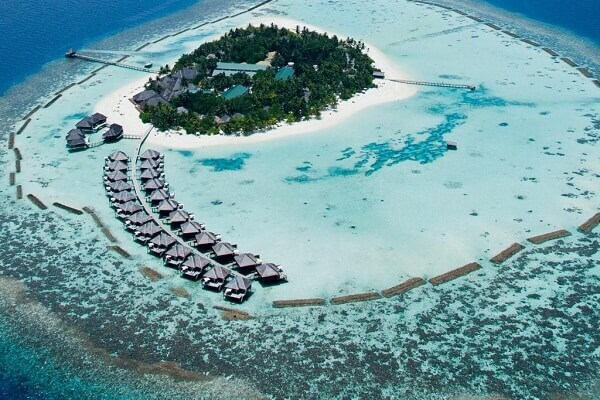 It’s a four star resort, and has 62 water villas in 3 different styles and sizes excluding 42 island rooms. For guests, they offers free Wi-Fi, air-conditioned rooms / water villas, beach access, room service, laundry service, and much more at the best rates available. A basic all inclusive stay includes most drinks and food. In addition to this, the resort offers a premium Island Club, which includes an additional restaurant, and many other great facilities. The Centara Grand Maldives overwater bungalows / water villas features a Jacuzzi spa and a heavenly feeling rain shower on the deck. It is one of the best resorts to stay for every celebration. 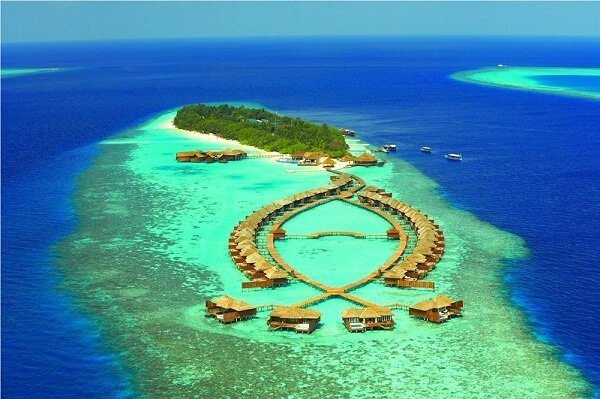 Vakarufalhi Island Resort is one of the best all inclusive Maldives water villa resorts. It is one of the most popular and traditional water villa resorts in the Maldives. The resort offers two types of plans, “full board”, and “full board plus” which includes a massage, drinks, and other things. 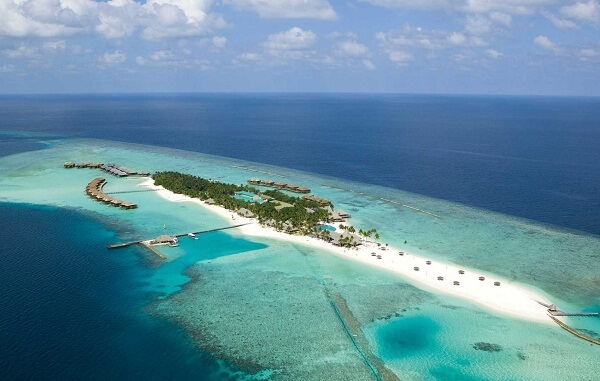 The resort is easily accessible by seaplane from the Male International Airport. 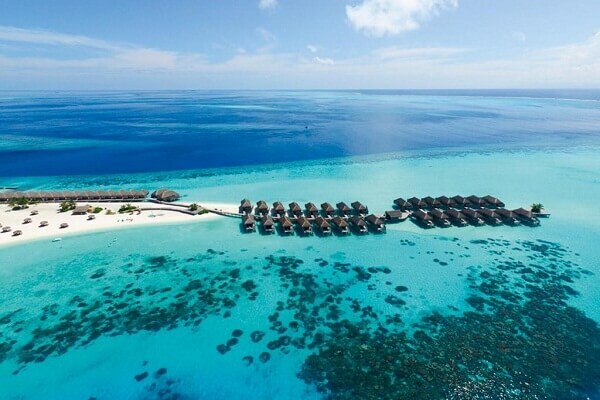 All the water villas / overwater bungalows are equipped with latest facilities / amenities, such as DVD player, LED TV, a semi open-air bathroom, and much more. The resort offers a lot of water sports activities for their guests. It’s a child friendly resort, one of the main things for family travels. A room service, and spa are added advantages for your stay. Article first published on November 26, 2018. Previous ArticleAre Overwater Bungalows Even Worth It? Is Overwater Villas Really Worth It?